Welcome to Poetry Friday! I’m happy to host the poetry party today. When I was a kid, I remember reading a newspaper article about Jewish policemen in New York City who volunteered for extra shifts around Christmas so their fellow officers could spend more holiday time with their families. The article made a big enough impression that I remember it today (probably inaccurately, but still…) and it inspired me to host the close-to Christmas poetry friday shift for the past couple of years. Not that being your host is difficult–but I’m glad to take away stress from others who don’t need it now. Now for the good news–the sun set yesterday at 5:12 p.m. in southwest Michigan, but this evening’s sunset is at 5:13! Although one minute doesn’t seem like much, I’m always delighted by the noticeably longer days of mid-January. The promise of more light is encouraging at a time when many of us hunger for it. We’re drawn to light during December’s dark days, and it’s no surprise that many cultures celebrate this time of year with candles. I’m looking forward to eight nights of Chanukah lights starting tomorrow night. And of course, poetry can bring us light. This entry was posted in Uncategorized on December 23, 2016 by Buffy Silverman. So snowy! I was caught in a blizzard a few weeks back when I was up north, but now it looks like I’ll have a green Christmas! 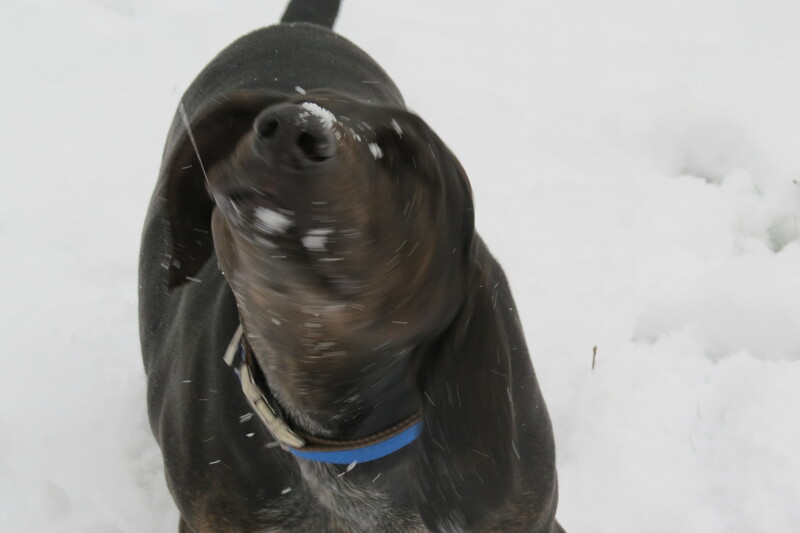 Enjoy the snow, and the doggy fun! These are great, Buffy! I especially love “dog-tired.” Happy Chanukah! Thanks, Michelle. And a merry Christmas to you! Same to you–he is indeed a spirited fellow! Love your haiku and the wonderful images you’ve crafted. I like them all but especially, “stories told in tracks: paws sprint from swamp to woods, while boots plod well-worn paths” and the photos are perfect. I too, take note of sunrise and sunset minutes at this time of the year. May your celebrations this season be filled with light. Thank you, Alice–and at the same to you! Thanks for hosting!!! 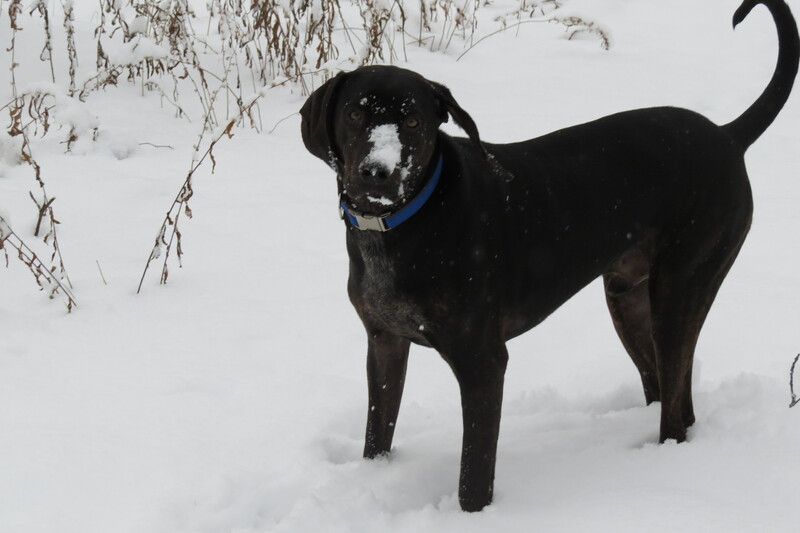 I love your dog haiku, especially the stars and the “breathing the moment.” Your four-legged friend could be a twin to my black lab mix, who also loves the snow, and would love to run free, if we lived somewhere where there weren’t so many cars. Happy Solstice! Like you, I’m already longing for more light! 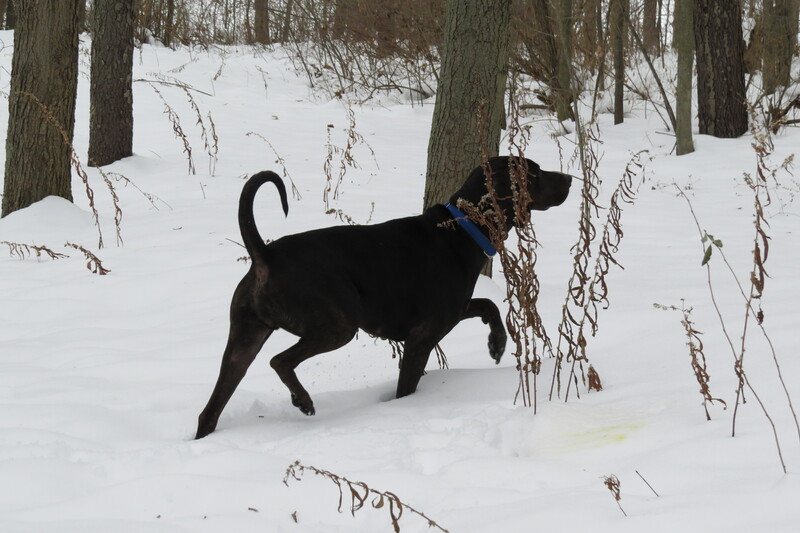 Ours is a rescue dog–plott hound and maybe some lab thrown in too. He only gets to run free behind our house, which fortunately for him is a couple of acres. Yes to more light! I noticed you hosted the last post before Christmas last December as well. Now I see that this is entirely intentional. Thank you!! I love your doggy haiku. The one that especially zinged with me is the “white stars on black dog” – Lovely! Thanks again and Happy Hanukah! Thank you, Violet–one of these days he’ll hold still long enough for me to photograph the falling flakes that land on his back! Oh, how I love your doggy-haikus! 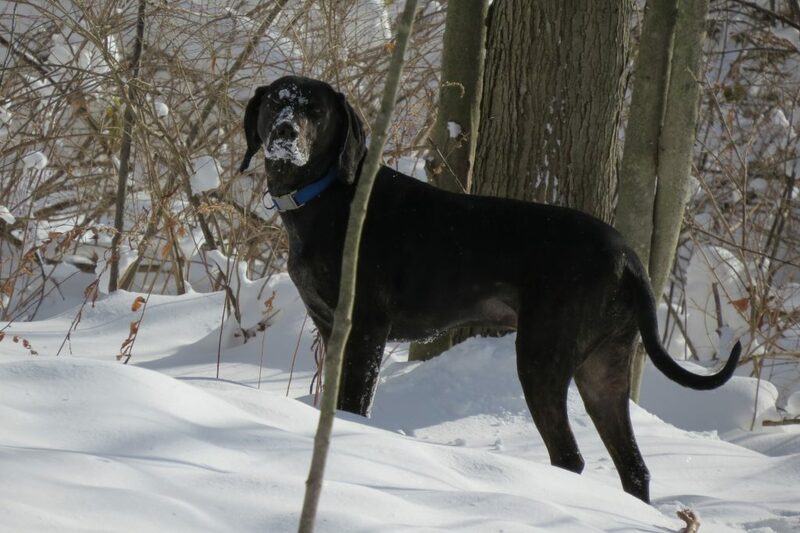 They bring back lots of fond memories when we had dogs who buried their noses in the snow and gathered stars on their black backs. We take the cat out on lead, but he is still a little finicky about stepping into the white stuff. Thanks for hosting — we need all the light we can get, whether it is brought to us in actions, words, or lit candles. Yes to more light! And thank you, Mary Lee, for inspiring folks to write some wonderful haikus this month. Oh I would have enjoyed that solstice reading…and the feeling is mutual, wonderful Irene! Thanks for hosting today’s PF round-up, Buffy. Love your linked haiku. Also love that one-minute-more of daylight after the solstice – sweet. Happy Holidays to you and to everyone reading the posts/comments! And a happy holiday to you, Julie–here’s wishing more light to you! Thanks for hosting us and for this lovely linked haiku about your dog in the snow. I appreciate your hosting us today. Actually in many hospitals the Jewish members of the staff work Christmas shifts so Christians can have the day with their families. Here’s to those dedicated people who help us all during the holiday season. I appreciate your taking the stress off the rest of us. While you are dealing with snow, we had 79 degrees yesterday. I do love living in Paradise. Kauai is a garden island. Mele Kalikimaka. Yes, my dad always was on call on Christmas. I think my mom liked it because then they could go to their soirees on New Year’s Eve. Our early snow has been lovely–but it’s made me ready for 79 degree weather about now! Mele Kalikimaka to you and Barack. Thanks for hosting! Love your dog inspiration. They do love the snow! Glad you are trying your hand at haiku! Nice! Thanks, Donna. Ours loves the snow, but not the cold. He was quite relieved when the temperature bounced back into the 20s and 30s. And so winter begins as a new season of longer days. Yes, for more light. Happy Chanukah to you, Buffy. Thanks, Carol, and thanks for putting together your lovely galleries. Hope your holidays are warm. Thank you for taking on the hosting and sharing your haiku moments Buffy. You have snow and here in Australia we are on the verge of a heatwave. Greetings, Alan–hope you can stay cool during your holiday! Buffy, I love your Hound Haiku. “stories told in tracks” I love that line. Thank you for hosting. Poetry does bring us such light! Those stories are getting a little hard to read, Kiesha–our wandering dog has covered a lot of ground! Thank you, Friend, for taking on the Round-up duties this week! Your full-of-life dog, in the great photos and in the poems he inspires, always warms my heart (& a handsome fellow he is indeed). Thanks for sharing all. Wishing you & yours a Happy Hanukkah and a light-filled 2017! I try to show his good side…he can be a handful! And a Merry Christmas to you, my friend. You’ve taken to haiku like a duck to water! Have a lovely Hanukkah! What’s your favorite Hanukkah treat? Thanks, Diane. Your suggestions on my previous post were very helpful. I’m partial to candles–as a kid I always loved to make finger prints in melted was (okay, I still do that) and I love their multiple reflections in our bay window. Thanks for the poems, Buffy. Happy Hanukkah. And thank you, Ann, for always coming to visit. Happy Hanumas to you and your gang! Happy Chanukah, Buffy. You are a dear for sharing the way you do. I echo Matt’s sentiment….ummmmm that’s a heck-of-a haiku string for someone who proclaims to be more of an admirer than a creator of them. I have really enjoyed the #haikuforhealing. The practice of daily haiku is truly healing ( and a little bit addicting). I look forward to your creativity and sharing in 2017. Thanks, Linda–your haiku and paired photographs have been wonderful to read! For someone who is more an admirer than writer of haiku, you did a great job! 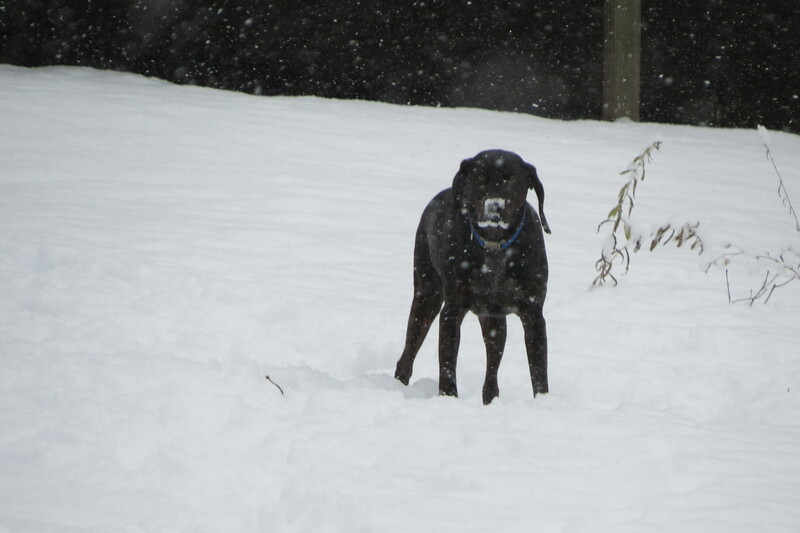 These are very nice, Buffy…and your pooch seems to be loving the snow…looks like you’ve got almost as much as we do! Oh, and thanks for hosting, by the way…and have a nice holiday, as well! Thanks, Matt. 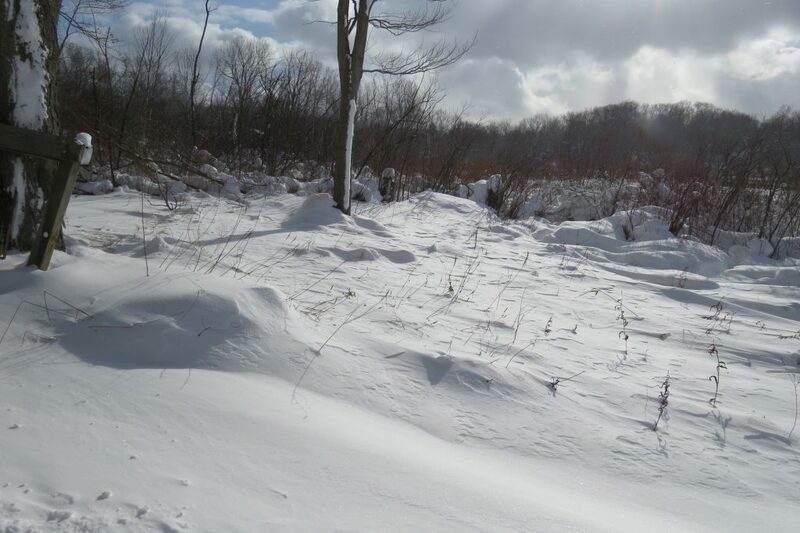 We had about a foot of snow (we are far enough from Lake Michigan that it’s hit or miss whether we get the lake effect snow, but this year have gotten a lot.) Now it’s warming up and melting fast. Happy holidays to you!